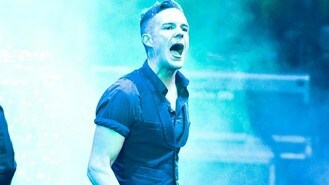 Brandon Flowers, lead singer of the American rock band, suffered vocal problems following a viral infection and was unable to finish their set on Tuesday. Wednesday night's show was also postponed. In a statement on their Twitter and Facebook pages, the band said "Manchester, we started something we couldn't finish and we're so, so sorry." New dates for Manchester have been set for February 17 and 18 next year. The band's two sold-out shows at London's O2 Arena this Friday and Saturday will go ahead as planned.